For some people it is intriguing to take the path that less people have committed to. There is something about stepping outside of their comfort zone in order to follow what feels right in their hearts. Either choice of course will have its own benefits, but there is a lot to be said about the independent spirit of the person who takes that path less traveled. 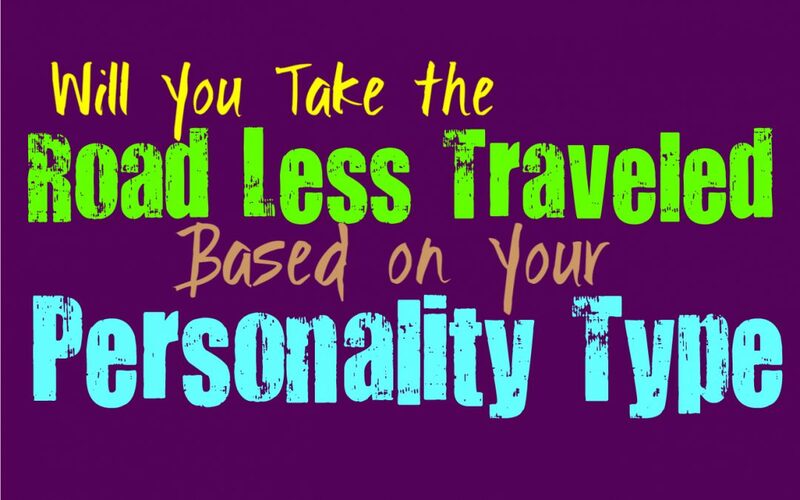 Here is how likely you are to follow the less traveled road, based on your personality type. INFJs are independent people, but in ways that aren’t always obvious to others. They do enjoy staying inside of their comfort zones and it becomes a bit difficult for them to really step outside of what they know and understand. For the INFJ taking the road less traveled can sometimes happen naturally, since they find themselves going in a direction which others don’t quite understand. INFJs might not enjoy taking the path that everyone else expects of them, but at the same time it can be unnerving to step outside of what they personally find comfortable. ENFJs are very independent people and so they really aren’t afraid of choosing the path less traveled. They don’t need to follow what other people expect of them, as long as they know they are making the right choices. ENFJs do however, find themselves swayed by the people closest to them when it comes to the choices they make. They want to please these special people and will do anything to make them happy. In most situations they are capable of taking their own path in life, and often want to bring these people along with them. INFPs don’t like simply following a path because it is where everyone else goes, since they are much more independent than this. They have strong inner morals and they believe in always staying true to themselves and their beliefs. Because of this desire to follow what is right INFPs can often find themselves taking the path less traveled. They do what is right for them without wanting to pay attention to what other people expect of them. INFPs don’t like simply doing something because it is following what others do, since this feels insincere for them. ENFPs definitely find themselves heading down the path much less traveled by others. They don’t like simply following what other people expect of them, instead they do what is right for themselves. ENFPs often find themselves heading in completely different directions, sometimes changing their minds last minute. They want to do whatever inspires them the most and sometimes this gets them into tricky situations. For the ENFP it is about making their own choices instead of doing exactly what is expected of them. INTJs make their decisions based on logic and factual information, rather than using their inner emotions. Because of this INTJs actually might find themselves following the more traveled by path, since this is one where the most information is laid out in front of them. They want to follow proven methods and prefer what is tangible, instead of venturing into the unknown without a sense of preparation. INTJs will certainly be capable of following the less traveled path, if that is the one that presents them with the solid proof that it will be the right choice for them. ENTJs are efficient people who believe in going after whatever is the most reasonable and logical choice. Their desire to follow proven methods is often what leads them down the more commonly traveled paths. For the ENTJ it isn’t about doing what everyone else is doing, it is simply about being able to prepare themselves for any given situation. Following the less traveled path often leaves them walking into the unknown and that simply isn’t something they are comfortable with. ENTJs want to be sure they are making the most logical choice, and this often means following proven methods. INTPs are certainly the type of follow the path less traveled, and they often seek them out. For the INTP following the direction everyone else heads down, often feels insincere and even a bit boring. They want to try new things and figure out what might be hidden in the places no one else is willing to look. For the INTP it is often about their curiosity which drives them towards experiencing the things that not everyone else is willing to take a chance on. They want to learn as much as they can and enjoy actually thinking outside of the box. ENTPs are definitely willing to take the path less traveled, since it can often be far more rewarding for them. For the ENTP it can really be about their curiosity and desire to experience something that not everyone else has taken a chance on. ENTPs dislike stagnancy and often want to veer away from making the choices everyone else follows. They don’t like feeling as if they are doing something just to fit in, and so they do often find themselves following the road far less traveled. ISTJs aren’t really likely to take the path less traveled, since they are for more interested in following proven methods. For the ISTJ going down the more commonly followed path means they are capable of preparing themselves for what is to come. They want to be capable of getting things done and being as efficient as possible. They don’t want to take risky choices which might lead to failure, since they have a lot of responsibilities on their shoulders. ESTJs are less likely to take the path less traveled, since they want to be able to get things done as efficiently as possible. Taking the paths that aren’t commonly followed, often means you are going into the unknown and ESTJs really don’t enjoy this idea. They simply want to be sure of their actions and choices and so this means being able to follow previously proven methods in order to get things done to the very best of their abilities. ISFJs are practical people who care deeply about taking care of their loved ones and providing for them. Because of their desire to take care of others the ISFJ doesn’t like stepping outside of their comfort zone. They often take the path more frequently traveled, since this path has plenty of information to help them prepare for what might happen. Following the unknown often means taking risks would could leave their loved ones feeling unhappy, and this just isn’t something they are comfortable with. For the ESFJ following the path less traveled can actually feel a bit selfish and far too risky. While they might want to take this path deep down, they simply don’t want to do anything which might jeopardize the happiness of their loved ones. For the ESFJ it is important to take care of their loved ones, and so they don’t like doing anything which might put them at risk. This leaves them following paths which are more predictable and can help them tend to the needs of those around them. ISTPs are definitely willing to take the path less traveled, simply because it offers them a challenge and some excitement. They enjoy being able to take risk and explore something new, without feeling like they need to follow the expectations of others. For the ISTP sometimes following this less popular path, is intriguing simply because it means they are encountering something unknown and even a bit frightening to others. They are very independent people and this certainly plays a role in their choices. ESTPs can certainly take the path less traveled, simply because they enjoy taking risks from time to time. For the ESTP sometimes it is all about stepping out of their comfort zone in order to really shake things up. They don’t like feeling stagnant and are often rather independent people, and this definitely affects their choices in life. For the ESTP sometimes following these less likely paths means they get to experience a different level of excitement and sate their sense of curiosity. ISFPs follow their hearts and so sometimes this does lead them down the less traveled paths in life. For the ISFP it isn’t about choosing to be different, it is simply about doing what they know is right for them. They want to be true to themselves and so simply following any path for the sake of others feels truly insincere for them. ISFPs enjoy experiencing life on their own terms, even if this sometimes leaves them feeling a bit alienated from others. ESFPs are unique people with open hearts and a curiosity which takes them all over the place sometimes. Occasionally their curiosity and desire to seek out excitement does take the ESFP down a much less traveled path. They do sometimes find themselves doing things which are completely unexpected for others, but sometimes they do the opposite. For the ESFP it is about what excites them most in the moment, and so they can be rather unpredictable because of that.